IPL 2019: Chennai needs 45 runs in 53 balls. IPL 2019: So, is it the catch of the IPL thus far? There have been some memorable catches like the one Pollard took with one-hand and etc, but it seems Chawla’s catch to dismiss Suresh Raina steals the show at point of time in the tournament. Chawla charged back from mid-on, kept his eye on the ball and takes a beauty. It was a flighted delivery wide of off, Raina wanted to loft it over long-on, it came off the bottom half of the willow and went a long way up in the air. 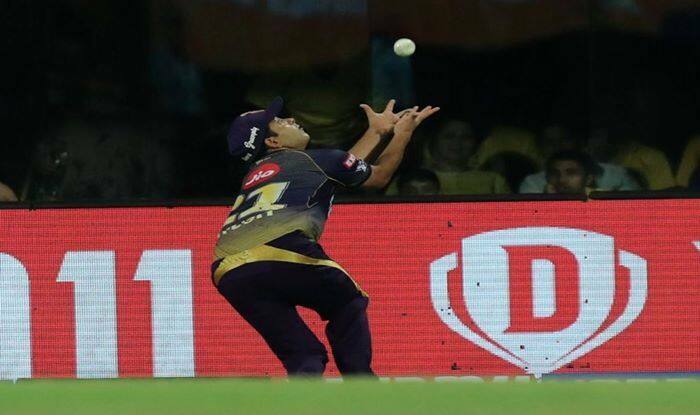 And Chawla there did exactly what the KKR wanted him to do in the outfield. He took the catch and more importantly held onto the ball when he finally landed. It was an important catch as KKR are defending a paltry 109 against the defending champions. What makes this catch even more special is the fact that he had to run back a distance keeping his eyes on the ball. It may not impact the eventual result but it goes to show the spirit of the cricketer who is ready to fight every inch. Meanwhile, Deepak Chahar took three wickets as Chennai Super Kings (CSK) restricted Kolkata Knight Riders (KKR) to 108/9 in 20 overs in an Indian Premier League encounter here on Tuesday. Chahar (3/20 in four overs) shaved off the KKR top order early and was well supported by veteran Harbhajan Singh (2/15 in four overs) who was very economical and Imran Tahir (2/21 in four overs) as Chennai never allowed the visitors to get an upper hand after they were asked to bat first by M.S. Dhoni. The defending champions led admirably by Dhoni, even kept Andre Russell quiet as the big-hitting West Indian scored 50 off 44 ball not out, his innings laced with five fours and three sixes. KKR never really got going and it looked like they would not cross the 100-run mark before Russell — struggling with niggles — hit Scott Kuggeleijn for one six and two fours as the purple brigade managed to get 15 runs off the last over.